Great for risottos, soups and salads. Source of fibre and protein. Slow release energy. Organically grown. Great taste 2017. Vegetarian Society approved. 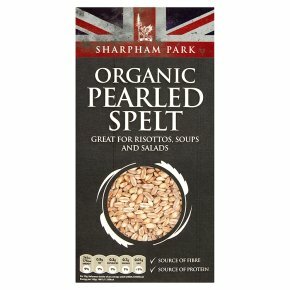 Suitable for vegans.We produced our organic pearled spelt by bouncing it over rotating stones the outer layer of bran and "pearl" the grain. This means that during cooking it soaks up all the flavours of your dish and it makes the most amazing risottos, soups and salads. The Ancient Grain Spelt, an ancient grain, has been grown in Somerset since the start of the Iron Age. Spelt has gained in popularity in recent times because it's an excellent source of dietary fibre and contains protein as well as vitamins and minerals. It is both easy to digest and leaves you feeling fuller for longer as well as being a good source of slow release energy; so much so the Roman Army called it their "marching grain". It's Easy to Cook... Rinse well and boil for 20 minutes, strain and serve.